15ft Custom Feather Flag Kit w/ Ground Spike - Easy install package! $174.99 $129.99 26% off *Discounted price shown in red box. Our 15ft custom feather flag kit is the most popular size and style from all our custom flag options. May it be teardrops, rectangle banners, blade flags, or anything else, our feather flags always end up being chosen. Additionally, this size also matches our 600+ stock feather flags that we carry. This allows clients to replace stock flutter flags with these custom feather flags and vice versa. 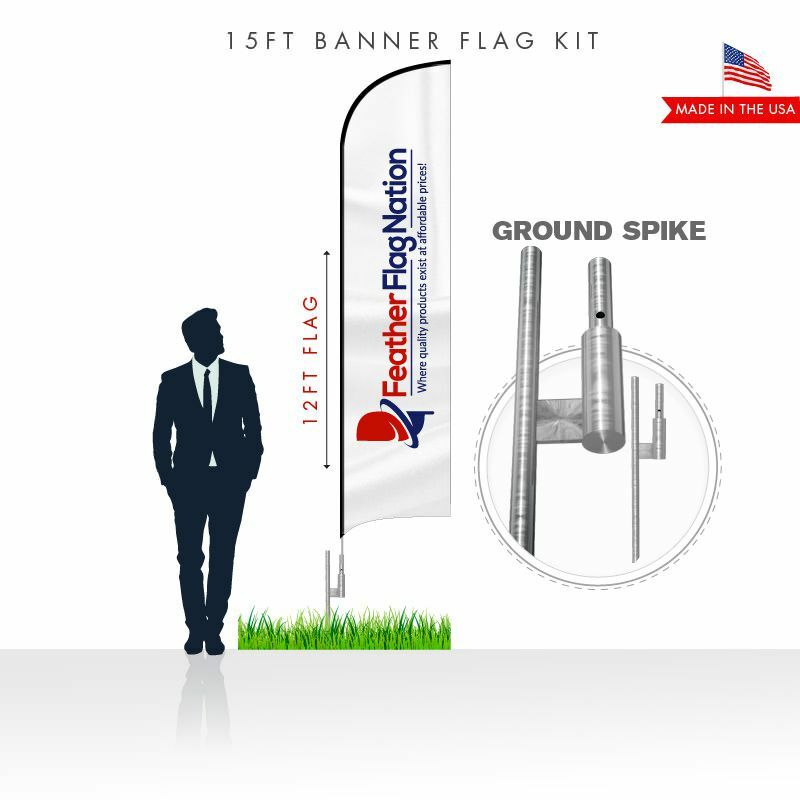 If you are looking for long term outdoor promotional products, then the 15ft custom banner flag kit is made just for you. This kit can be used outdoor 24/7. We do advise to take the kit inside during high winds or severe weather conditions. Your item will wear and tear quicker if you do not. The most popular mounting hardware for our 15ft feather flag kits is the ground spike. It is made of metal with extra strong weldings. No tools are neccessary to mount the flag kit into a grass or dirt area. Simply twist the ground spike into the dirt, if have very dry and tough dirt, then a hammer may be needed. 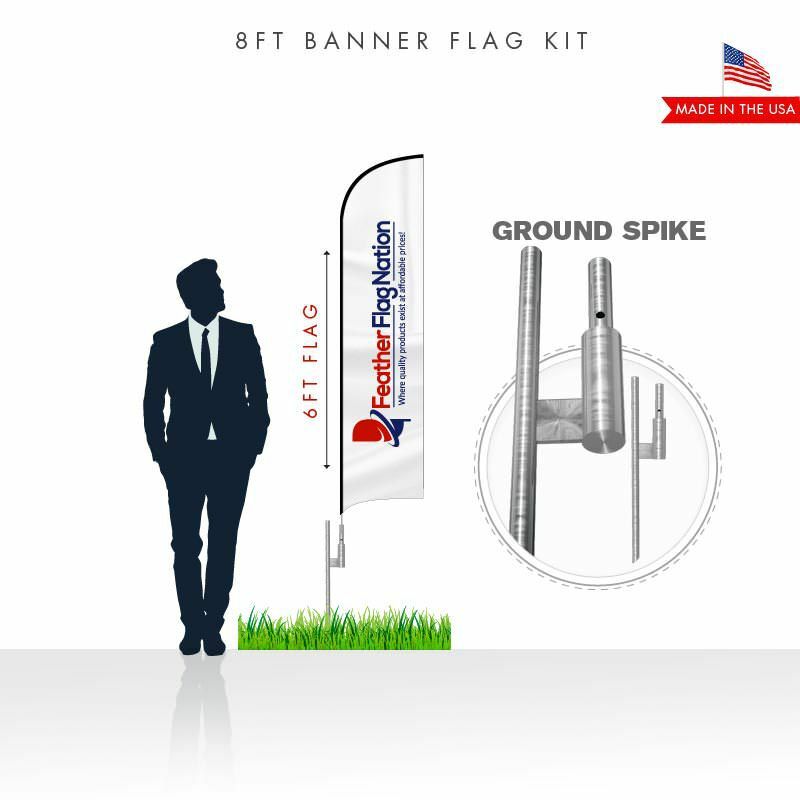 Our metal ground spikes also allow easy removal and therefore you can use your 15ft custom banner flag kit at any dirt location around your business. You are not stock with one location for outdoor advertising. If you are looking to increase your sales or simply create a presence, then this 15ft outdoor advertising flag kit is a must. Looking to order large quantities? Contact us first at sales@featherflagnation.com to get your discounted quote. We offer generous discounts to all non profit organizations and special events teams. This feather flag is sold with no color restrictions. 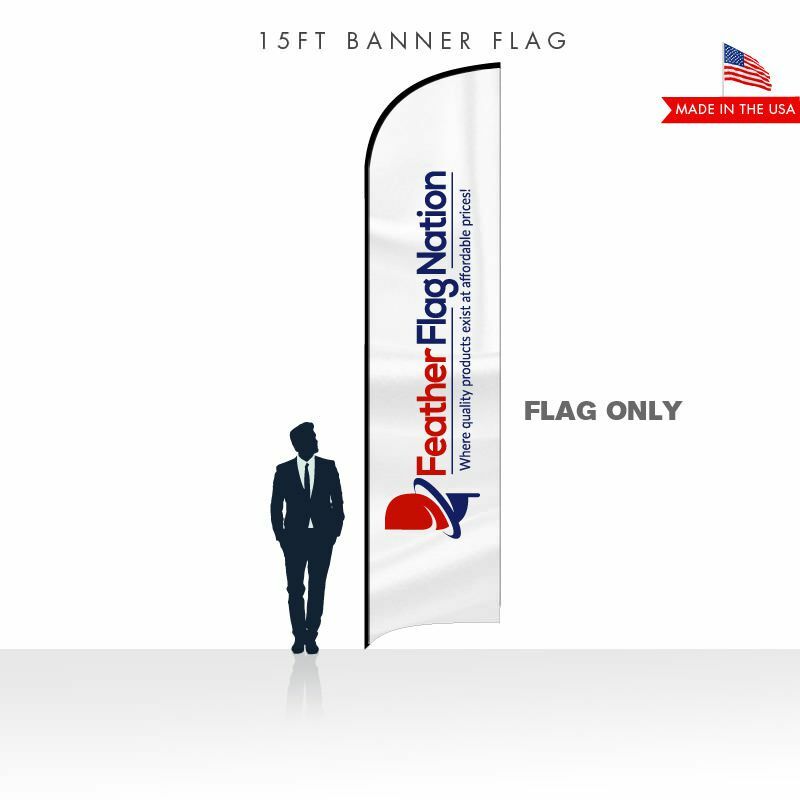 You can use live images, gradients, and any number of colors for this custom advertising flag. The ink penetrates through the material to display a reversed image on the backside. This feather flag kit measures approximately 15ft feet tall when assembled. The flag itself is roughly 12ft x 2.5ft. The pole breaks down into 4 parts, which can easily be stored within the trunk of your car. If you are looking to travel with this item, be sure to select the travel package upgrade. The travel bag will allow the feather flag kit to be easily stored within the canvas carry bag. 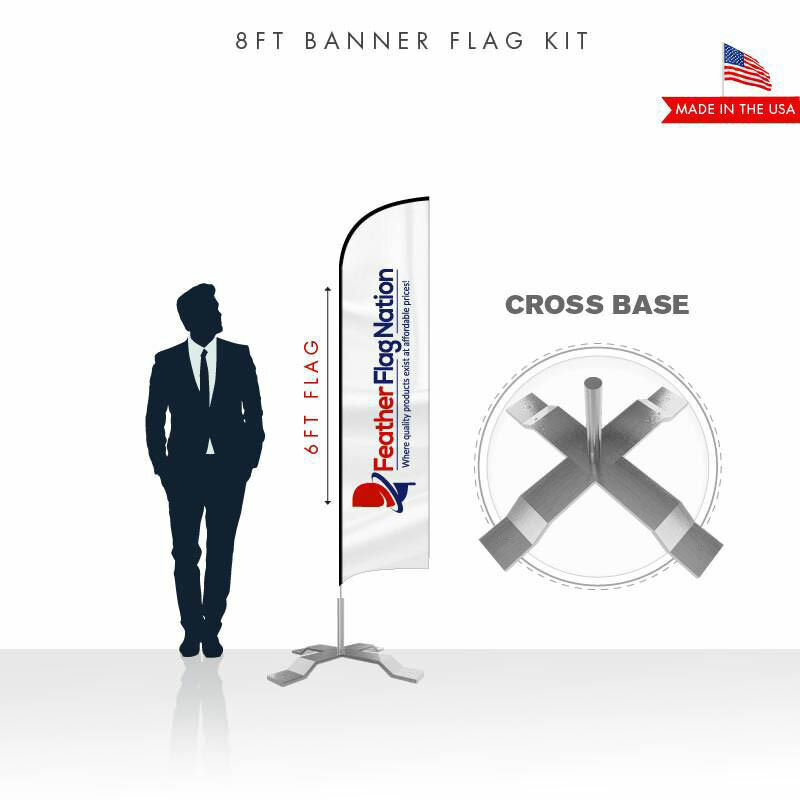 If you need to use this banner flag on a solid surface, you will need to upgrade to cross base. This allows the users to use the 15-foot-tall banner in any location, including both indoors and outdoors. If you select the double-sided upgrade for this flutter flag, then the flag will have two true sides. We will print two flags (the front and the back), and sew them back to back with a 100% block-out in the middle. Double-sided feather flags are preferred by most clients. If it is within your budget, we would recommend upgrading all of your flags to double-sided prints. The standard kit includes a flag that is single-sided reverse back. If you would like to upgrade to a 2SD flag, please select yes for the double-sided feather flag upgrade option. Double-sided advertising flags are two flags stitched back to back with a 100% block-out in the middle. Q What version of AI should i save the custom files as? A Any version just make sure all files within your AI are outlined.